3.13 7.08 Season Seven, Time for a Wedding! 3.17 8.02 What's Up, Tiger Mommy? The Alpha Vampire was the very first vampire and has a psychic connection with other vampires, whom he deems his "children." By the year 2006, vampires had been hunted so intensively and become so rare that John Winchester had thought they were extinct. 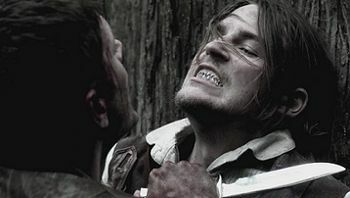 But in the year 2011, as directed by Eve, the Alpha Vampire uses his psychic connection to encourage vampires to focus on increasing their numbers. Dean kills all the vampires he finds in one nest, but it is unknown how many other nests may have been created or increased their numbers. In 2017, the British Men of Letters enacted Project V -- the systematic elimination of all vampires located in the American Midwest. The BMOL were able to dwindle the vampire population in the Midwest from 241 to a single nest of 11. In Apocalypse World, it was shown that after the Apocalypse occurred and the human population dwindled significantly, vampires, like all monsters reverted to a more feral and instinctual state of being. A vampire is created when a person ingests vampire blood, but the transformation is not complete until they feed on human blood. Once turned, they suffer from bloodlust and must feed on blood, human or animal, to survive. In rare cases, the transformation results in bloodshot eyes as seen with Gordon Walker and Alex Jones. Unlike folkloric vampires, they do not require an invitation to enter a home and are not killed by sunlight, however prolonged exposure to sunlight can be painful. They also prefer to live in packs in locations called nests, and will mate for life. After death, like all monsters, vampire souls go to Purgatory. Enhanced senses - Vampires are able to smell humans and vampires over long distances, once a vampire has your scent, they have it for life. Vampires also have the ability to see in pitch darkness, and have been known to exhibit an animalistic eyeshine effect (only shown in 1.20 Dead Man's Blood and 12.14 The Raid). Immortality - Once a human is turned, they become immortal and unchanging. Infectious blood - Vampiric blood is highly infectious, a human can be turned by being fed a vampire's blood or if the vampiric blood comes into contact with an open wound or cut. Regeneration - If a vampire has enough blood to feed on, they can heal quickly from any wound besides amputation. Retractable fangs - Vampires have a second row of sharp teeth that emerge from their gums and extend beyond their human teeth, allowing them to rip out the throats of their prey. The Colt - A special bullet fired from the Colt can kill a vampire. The gun is capable of even killing the Alpha Vampire. Dead man's blood - A syringe of blood from a corpse can paralyze a vampire and cause wounds that are slow to heal. More recently, hunters have taken to coating bullets with dead man's blood to achieve the same effect. Decapitation - Cutting off the head of a vampire will kill it. Smiting - Angels can burn vampires from the inside out with a touch, killing them. Sunlight - Not deadly, but can cause a nasty sunburn and their eyesight is sensitive to UV light. Vampires prefer to sleep during the day. Vampire Cure - A cure for vampirism exists, but only if the vampire has not yet drunk human blood. 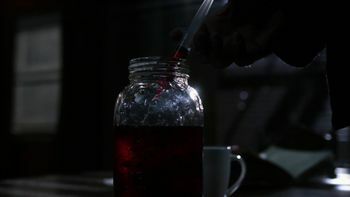 The infected will need to drink a mixture that includes the blood of the vampire that turned them to reverse the effects of the vampirism. Vamptonite - The blood of humans which has been poisoned by the Leviathan food additive is fatal to any vampire who ingests it. Called "vamptonite" by Dean, this is also effective if the blood is injected directly from a syringe. While trying to learn about the circumstance that lead to the death of his fiancé, Ennis Ross sneaks into the monster club in the back of the restaurant he was dining the night prior. He quickly comes face to face with an employee of the restaurant, who reveals himself to be a vampire. 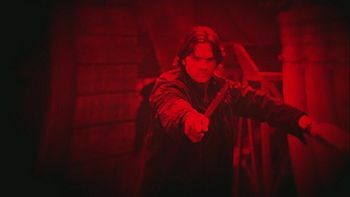 Ennis fires his weapon into the vamp, which has no effect, just as it is about to feed on Ennis, Sam and Dean arrive cut off its head. As part of their American operations, the British Men of Letters begin Project V, a plan to wipe out all vampires in the United States. Armed with the anti-vamp device or AVD, the British operatives kill 230 of the 241 vampires in the Midwest Region of the United States with the remaining vampire retreating to a single nest in Wichita, Kansas. 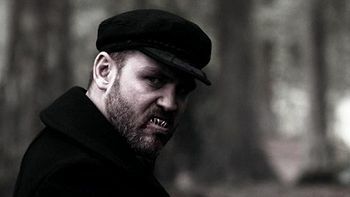 However, the deaths of so many vampires draws the attention of the Alpha Vampire who rallies the remaining Midwest vampires to strike back against the British Men of Letters. 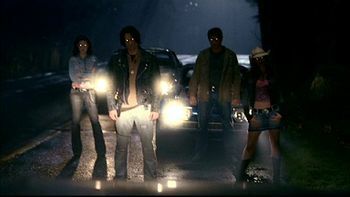 When the attack begins, Sam is in the BMOL mobile command as Mary Winchester was trying to entice him into joining the operation by showing Sam what they were up to. The vampires kill two British operatives and breach the compound, but Sam and Mary manage to capture the nest leader and kill another vampire. Before being killed by Mary, the vampire reveals that the Alpha Vampire is leading the raid. Michael has abducted a nest of vampires in Duluth, Minnesota, where in an abandoned church he begins performing experiments in an attempt to enhance the vampires through the mixing of their vampiric blood and small amounts of his grace, however the experiments prove to be fatal, burning all the vampires from the inside, all but for one woman named Lydia Crawford who was able to escape. When Sam, Bobby and Mary are able to track her down, she gives them the location of Michael's church in exchange for letting her live. As Lydia is packing to leave, she is visited by Michael who tells her he let her escape as he needed bait for the hunters, with her usefulness expended, Michael smites Lydia. While searching for Dark Kaia, Sam, Dean and Jody come across three vampire heads on pikes in a clearing in the woods. When Sam asks Jody if the heads match her three decapitated victims, Jody assumes they belong to her John Does, but tells Sam that she had Alex test samples of the bodies with silver and dead man's blood, which had no reaction. After Maggie is captured by the djinn, Neil, he uses his enhanced powers to manifest Maggie's greatest fear -- a vampire from Apocalypse World which were responsible for the death of her family. When Sasha Rawling hears a strange noise coming from the attic, she goes to investigate, but is thwarted by the appearance of the vampire, who scares her off, but does not give chase. 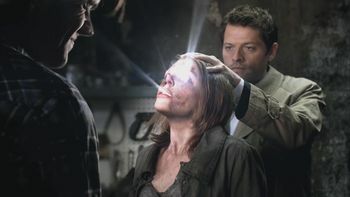 Finding Maggie strung up in the attic, having her blood drained, she warns Sam of the vampire, which attempts to attack Sam, but is pierced in the chest and explodes into dust. A vampire named Brett helps clear an office building of people, choosing to not feed due to Michael's coming plan to send his army out in Kansas City to feed and turn the cities population into monsters. 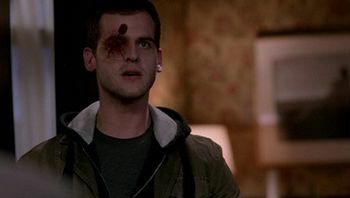 While checking around the building, Brett is surprised by Sam Winchester, who decapitates him. 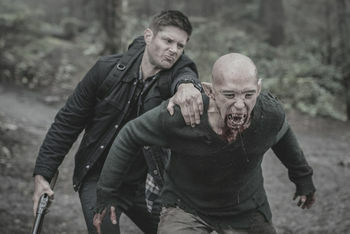 A vampire is one of Michael's Monsters that attacks the Bunker to rescue the archangel. Along with the other attacking monsters, he is disintegrated by Jack Kline using the power of his soul. This page was last edited on 9 March 2019, at 04:16.